Apple’s sweet October: users are hit by new Macs and stock hits all-time high! Let’s leave the boring economic & stock details to those really interested into this [so click here to read more Apple stock news], but Apple’s shares got up to $ 205.04 - super-atmospheric price! For us, geeks, Mac-users and -lovers, what’s more important? On Oct 20th Apple introduced so many new produts and updates I barely can name all of them here, so let’s get a list to begin. new iMac, it’s that simple: 21.5 and 27 inches display, new CPUs up to Core i7 Quad processors, up to 16 GB Ram (from the 8 Gig previously allowed). Simply gorgeous! Several built-to-order options for Graphics cards, CPU, hard disk units available. new MacBook: white policarbonate chassis but with unibody construction style, multitouch trackpad, 13.3 Led display. new Magic Mouse: almost an iPod touch or a multi-touch trackpad - in a mouse! All the mouse surface is smart enough to keep track of your gestures! Mac Mini: despite all rumors (and death bell tolls) it’s still alive - and fine! The 2009 Mac Mini sports a faster processor, twice the RAM, energy-saving features and a lot more! A product I’m really interested in is the Mac Mini with Snow Leopard. A special edition Mac Mini fully loaded with 4 Gigs of RAM, two 500 GB hard disks and pre-installed Snow Leopard Server with special remote management features. Right now it’s the best way (and the most affordable yet) to get a great Mac server for your Home/Office and to fully integrate PCs and Macs! Mac Mini with Snow Leopard Server (unlimited license) is available for US $ 999. The guys at MacSwitching.com just reported that Apple has just updated Mac Pro, iMac and Mac Mini (after a few hours of down-service for world-wide online Apple Store). Mac mini -> all rumors confirmed: it’s totally revamped with NVidia 9400M graphics, in two models. - has a crowded backside with 5 USB 2.0, DVI and mini-DisplayPort (and yes, FireWire 800!). MacBook Pro 17 unibody: huge, powerful and… available! Have you been to Mars when Apple early this January announced the new MacBook Pro 17 unibody? Time to refresh your memory, since it’s now available! At first glance, you could easily mistake the new 17-inch MacBook Pro for its predecessor, the legendary 17-inch PowerBook G4 ( ; January 2006 ). The new model has roughly the same dimensions—at 15.4-by-10.4-by-1.0 inches and 6.8 pounds, it’s a shade wider, but a tenth of a pound lighter—and it retains the familiar aluminum enclosure and sleek design. The MacBook Pro 17″ desktop replacement of Apple can also be classified as a multimedia notebook, because of its 3.1 kg and only 2.59 cm height. Built-in lithium-polymer battery. Up to 8 hours of wireless productivity. Double heart and double brain - 2 processors convince with the MacBook Pro 17 inch. The outstanding workmanship, the good battery runtime in MacOS X and the competitionless small weight for 17 inch notebook even allow a mobile usage. The disadvantage is a large heat development, like already with 15 the inch notebook. According the performance the flat 17 inch racer exceeds the 15 inch notebook somewhat and does not show any performance weaknesses. So? What are you waiting for? Still have to sort out all stuff that’s been announced yesterday. iLife ‘09 which, along with all updates, introduces an interesting Garageband feature: music school lessons with the best artist around! Highly recommended: check these Garageband previews with music lessons from selected artists! Adobe Systems announced the Adobe Creative Suite 4 product family, a milestone release of the industry-leading design and development software for virtually every creative workflow. Delivering radical workflow breakthroughs that bring down the walls between designers and developers and packed with hundreds of feature innovations the new Creative Suite 4 product line advances the creative process across print, Web, mobile, interactive, film and video production. Adobe Creative Suite 4 combines virtually all of Adobe’s new design and development applications, technologies and services in a single box the most comprehensive creative environment ever delivered. Customers can choose from six suites or full version upgrades of 13 stand-alone applications, including Photoshop CS4, Photoshop CS4 Extended, InDesign CS4, Illustrator CS4, Flash CS4 Professional, Dreamweaver CS4, After Effects CS4, and Adobe Premiere Pro CS4. A simplified workflow in Adobe Creative Suite 4 enables users to design across media more efficiently by making it easier to complete common tasks and switch between mediums without leaving a project. InDesign CS4 includes a new Live Preflight tool that allows designers to catch production errors and a newly customizable Links panel to place files more efficiently. The revolutionary new Content-Aware Scaling tool in Photoshop CS4 and Photoshop CS4 Extended automatically recomposes an image as it is resized, preserving vital areas as it adapts to new dimensions. An expanded version of Dynamic Link in CS4 Production Premium enables users to move content between After Effects CS4, Adobe Premiere Pro CS4, Soundbooth CS4, and Encore CS4, so updates can be seen instantly without rendering. Designers using the Adobe Creative Suite 4 product family will be able to gain unprecedented creative control using the new expressive features and visual performance improvements in Adobe Flash Player 10 to deliver breakthrough Web experiences across multiple browsers and operating systems. Adobe Creative Suite 4 brings 3D center-stage providing the ability to paint, composite, and animate 3D models using familiar tools. Flash CS4 Professional now offers the ability to apply tweens to objects instead of keyframes, providing greater control over animation attributes. Also in Flash, the new Bones tool helps create more realistic animations between linked objects. With a searchable library of more than 450 dynamically updated device profiles from leading manufacturers, Adobe Device Central CS4 (see separate release) enables users to easily test mobile content designed using many of the Creative Suite 4 products. Adobe Creative Suite 4 significantly expands access to services available to creative professionals and developers who want to collaborate online. Adobe ConnectNow, a service of Acrobat.com, can be accessed from InDesign CS4, Illustrator CS4, Photoshop CS4 and Photoshop Extended CS4, Flash CS4 Professional, Dreamweaver CS4, Fireworks CS4, and Acrobat 9 Pro, allowing real-time collaboration with two colleagues or clients. Designers can also share color harmonies with Adobe Kuler™, which is now accessible from within InDesign CS4, Illustrator CS4, Photoshop CS4 and Photoshop Extended CS4, Flash CS4 and Fireworks CS4. Other online resources include: Adobe Community Help for technical questions%3B Resource Central for accessing video and audio product-related news and tutorials, as well as Soundbooth scores, sound effects, and other stock media%3B and Adobe Bridge Home, a customizable resource for tips, tutorials, news and inspirational content. Adobe Creative Suite 4 and its associated point products are scheduled to ship in October 2008. For a limited time, validly licensed customers of eligible versions of Adobe Creative Suite, Adobe Production Studio and Macromedia Studio will be able to upgrade to Creative Suite 4 for the CS3 upgrade price. Guitar Hero? Move on to the next level! Get a Behringer iAXE629 USB Guitar! Playing with Guitar Hero is pretty good enough but there’s a time for kid and a time for rock’n'roll men (or rock kids as well…). Get yourself a Behringer iAXE629 USB Guitar and starting playing guitar for real on your PC or Mac! Plug this amazing USB-guitar straight into your computer and turn your PC or Mac computer into a guitar amp and recording system without the need for any other hardware. You have a great song in mind and want to record it straight to your computer? You want all your amps and stomp boxes in your computer so you can rock like you’re in the studio or on stage? With the Behringer iAXE629 USB Guitar , you’re just a cable away. The iAXE629 USB Guitar comes with loads of great sounding virtual amps and stomp boxes from Native Instruments. Rock with your MP3, WAV and AIFF songs or backing tracks on your PC or Mac computer and enjoy nifty features such as time-stretching and a metronome. Behringer even included multi-track recording and editing software so you can record your music on the spot. This double-cutaway electric guitar delivers powerful humbucking tones and comes fitted with a vintage tremolo, making it an indispensable piece of gear for modern guitarists. A built-in output allows you to connect your headphones straight to your guitar so you can rock with your favorite bands. Cool, isn’t it? Plug in your new Behringer iAXE629 USB Guitar and rock the world today. Don’t take our word for granted and see for yourself what other users do with their Behringer USB Guitars on Youtube. 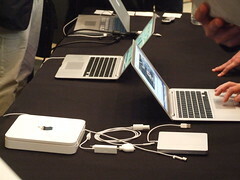 Partner site MacSwitching.com attended Apple’s presentation of new products like the MacBook Air and Time Capsule . There’s a dedicated photo gallery about all new January 2008 Apple products available here. MacBook Air is perfectly usable; keyboard layout is just like MacBook’s and the new LED display is much brighter and sports a wider viewing angle. What really impresses is how fine the MacBook Air , as well all other Macs integrate with Time Capsule and get easier the usually tedious task of backing up data on a regular base using Leopard’s Time Machine feature. MacNN reports that Apple’s MacBook took one of the top three sales spots during Amazon.com’s holiday season: Amazon.com announced the results of its 2007 holiday season, revealing Apple’s MacBook as one of the top sellers in the online retailer’s PC category, more exactly in the list of products most frequently purchased as gifts by Amazon.com customers in 2007. Since its update, as we reported in May, the Apple MacBook surged as one of the best selling notebook Macs and you can see it almost everywhere (Starbucks, college, business room etc.). Apple iLife ‘08 and iWork ‘08 available! Following the recent August announcements from Apple, iLife ‘08 and iWork ‘08 are now avalaible. The new iLife ‘08 features the same component softwares as before, same name but some are really brand new. iPhoto has been greatly enhanced and is now more Web2.0-compliant than ever thanks to .Mac Web Gallery too! Numbers, the new fellow! A brand-new spreadsheet, Apple-styled and (yes!) compatible with standard .XLS file format. No Mac user should miss these packages. No Mac business user should miss taking a closer look to iWork ‘08 : a great way to get for US$ 75 a complete Business Software Suite. Better late than never (see Sourcecrowd’s previous report here) Apple Apple’s new OS X iteration is coming: a definite sign that the Leopard will not suffer further delays is that it is now available for pre-order from a few outlets. So if you want to be one of the first to get your hands on the latest and greatest features when the 10.5 version of the operating system ships in October, click on the Apple links in this post to reserve your copy. To see some of the nifty new feautures of Leopard and for more information, go to Apple’s website. Apple Mac OS X Version 10.5 Leopard has a retail price of $129. Apple has announced an update to its MacBook Pro line of notebooks with the latest Intel Core 2 Duo processors, memory up to 4GB thanks to the new “Santa Rosa” chipset architecture, and high-speed graphics with the NVIDIA GeForce 8600M GT. The 15-inch model sports a new mercury-free, power-efficient LED-backlit display, while the 17-inch model has an optional high-resolution 1920-by-1200 display. Rounding up the high end specs, all models include a built-in iSight video camera, MagSafe Power Adapter, and built-in 802.11n wireless networking. Every MacBook Pro includes an Intel Core 2 Duo processor with 4MB of shared L2 cache, an 800 MHz frontside bus and 2GB 667 MHz DDR2 SDRAM memory, with 2.2 GHz and 2.4 GHz processor options for the 15-inch models, and a 2.4 GHz processor powering the 17-inch.